The primary objective of this trade show exhibit was to target the interior design and high-end hotel furniture buyers attending the HD Expo in Las Vegas, while garnering attention for the Bernhardt Hospitality brand. 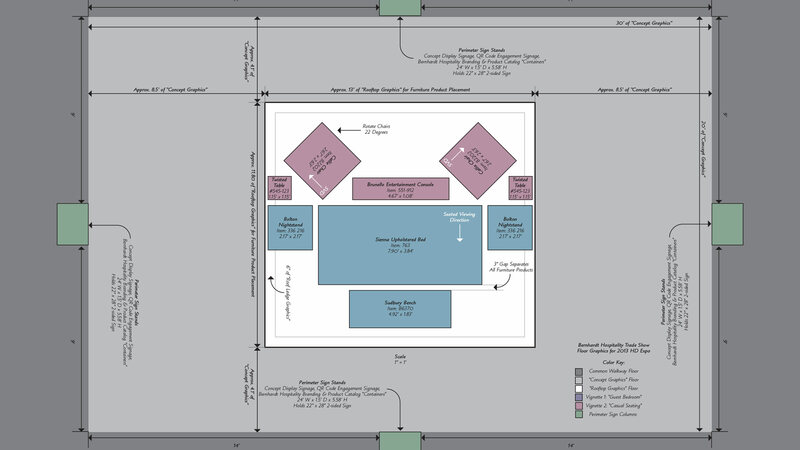 The concept was developed to push the boundaries of the trade show attendee experience and to create a “buzz” during the expo. As people walked through the convention center all day, viewing hundreds of displays, the need to resonate with them and make a lasting impression became paramount. If Bernhardt’s display could stand out in their minds after a long day, then Bernhardt would gain a stronger chance of the attendee recalling their display and placing an order. To push those boundaries, the focus became a “wow factor” – something the attendee wouldn’t expect and possibly provide a “shock factor” along the way. The experience for this floor display began on the four open sides of the floor graphics. A vertical sign post was placed on each floor edge to catch the attendee’s attention and encourage them to look down. Using standard cautionary colors and messaging for the perimeter signs, attendees looked down at the floor to make sure they didn’t trip or bump into something. 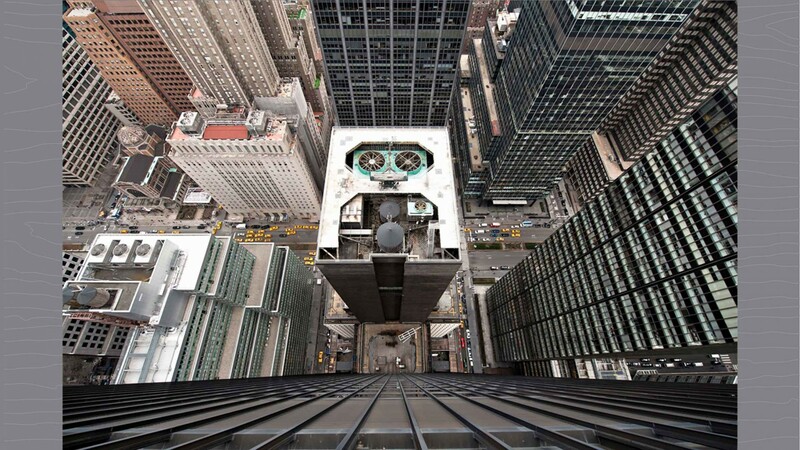 As they looked down, they viewed the city streets below from a dizzying height, with places along the edge of the floor graphics looking as if they were stepping off the edge of a skyscraper roof. 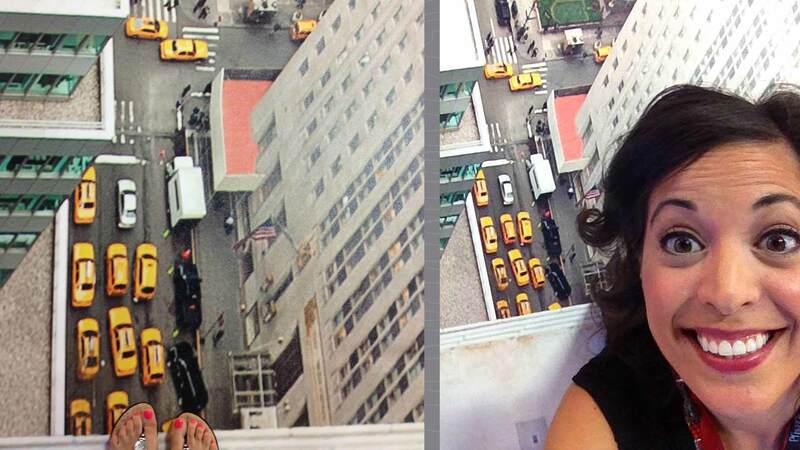 This floor design was created to receive an immediate reaction from the attendee, playing on their additional senses beyond sight alone, and forcing a sense of “vertigo.” The entire display floor was designed to look straight down at the city buildings, sidewalks, cabs and buses from high above. In the center of the display, Bernhardt’s furniture was grouped on the tallest building rising out of the center of the city. Bernhardt Hospitality taglines, positioning statements, and QR codes, which redirected attendees to a Bernhardt website where they could watch a behind-the-scenes video of the photo shoot, were placed along the ledge of the roof surrounding the furniture display. 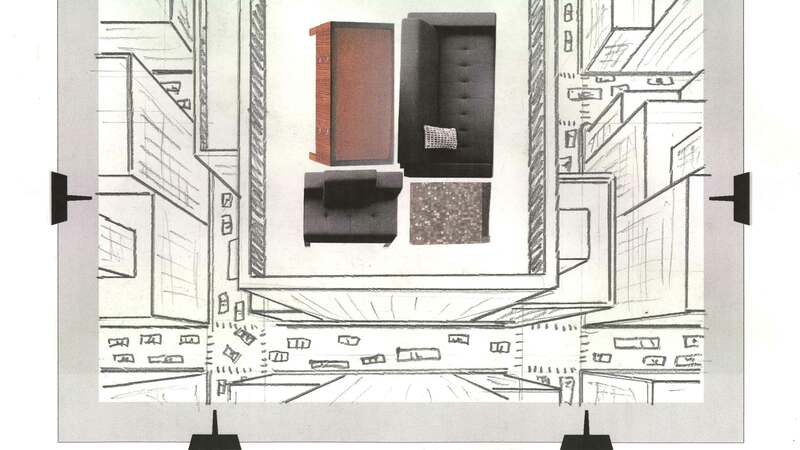 Conceptually, Bernhardt Hospitality was shown as transcending new heights in the hospitality furniture industry. 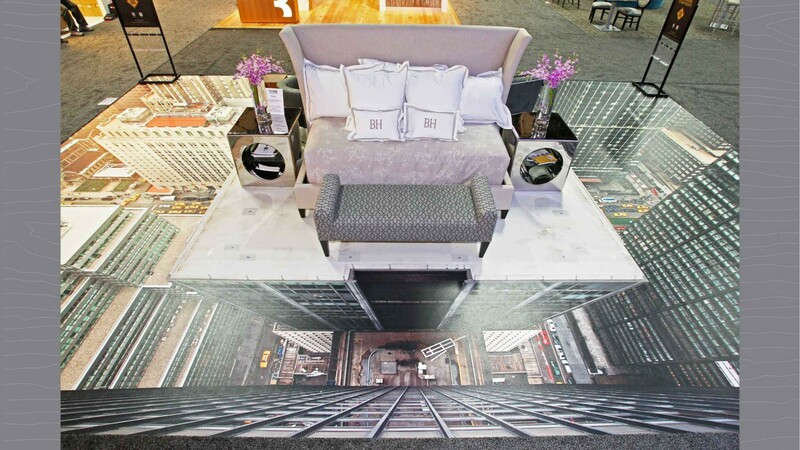 This clever exhibit floor design proved to be a huge hit at the HD Expo in Las Vegas. 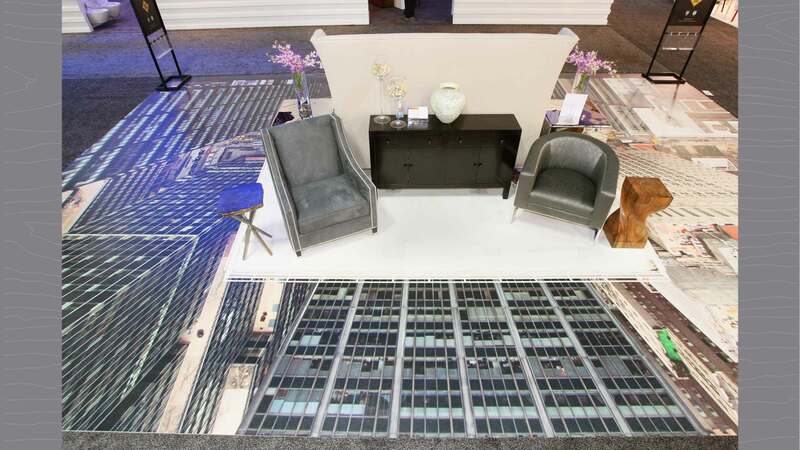 Bernhardt Hospitality received numerous comments and reactions about the floor graphics from attendees. 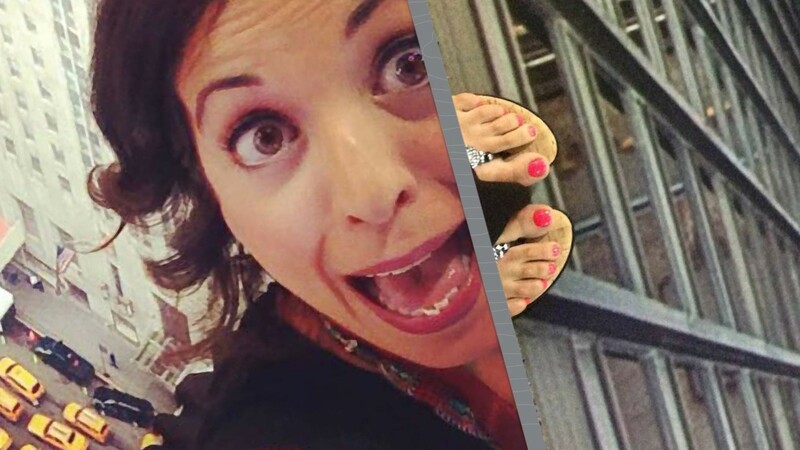 The client even received several fun photographs from attendees interacting with their exhibit floor, which for them, was a similar rush as finishing a ride at an amusement park. Above two images are full views of the original concept presented, and the floor diagram, created for the Bernhardt Hospitality Transcending to New Heights exhibit. Full view of original photograph commissioned and supplied for this project. 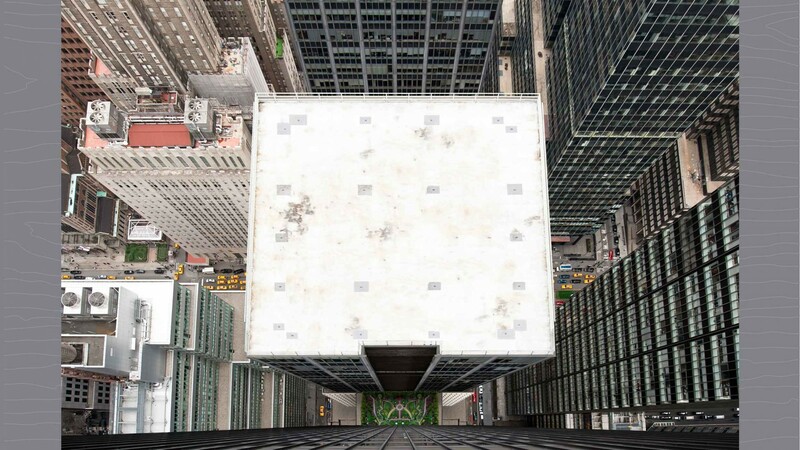 Full view of the photograph manipulated to fit the approved concept and creative direction for the Bernhardt Hospitality Transcending to New Heights exhibit. 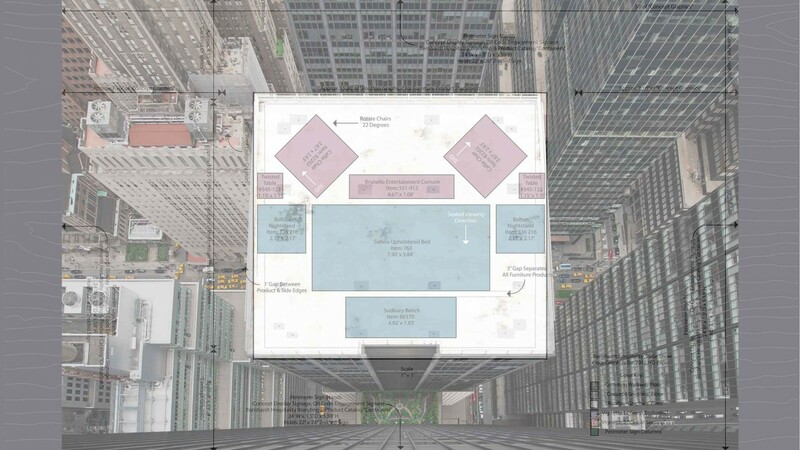 Composite view of the floor diagram superimposed over the manipulated photograph for the floor graphics. Full view of the approved final art supplied for the large format printing output. 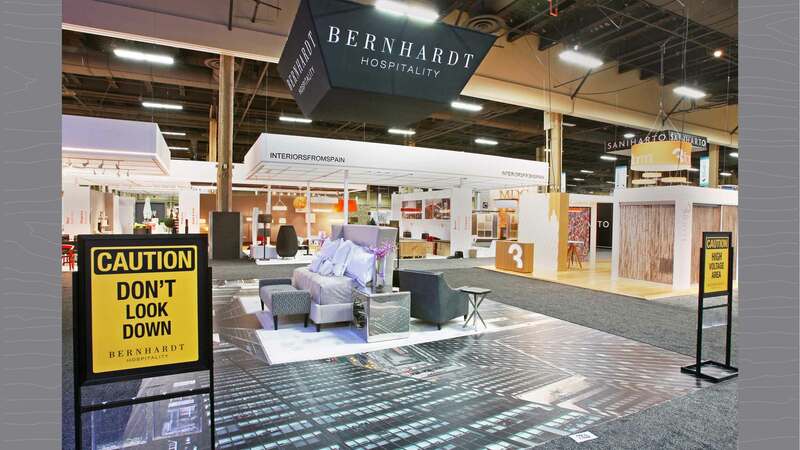 Full view of the final floor graphics with furniture product in place for the Bernhardt Hospitality Transcending to New Heights exhibit at the HD Expo in Las Vegas. 3/4 view of the final floor, placed furniture, perimeter “caution” signs and hanging Bernhardt Hospitality sign. Side view of the final exhibit, as seen at the HD Expo in Las Vegas. The final floor of the exhibit, as seen from above. Images of HD Expo attendees interacting with the final Bernhardt Hospitality Transcending to New Heights exhibit floor in Las Vegas. 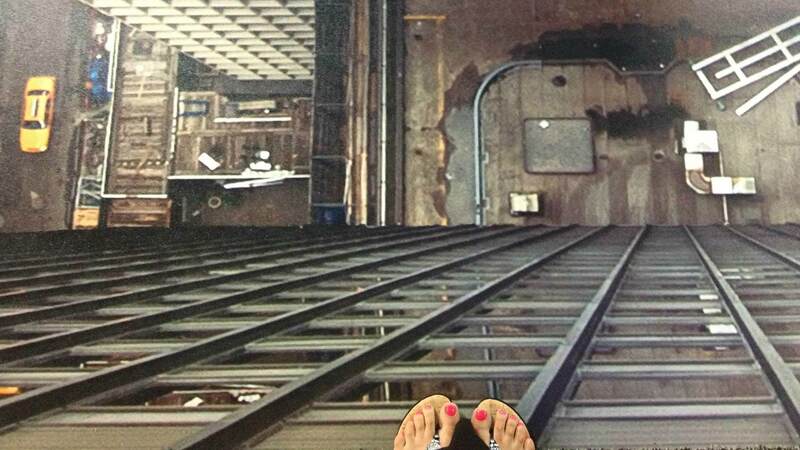 Close up view of an attendee’s toes hanging over the edge of a skyscraper. 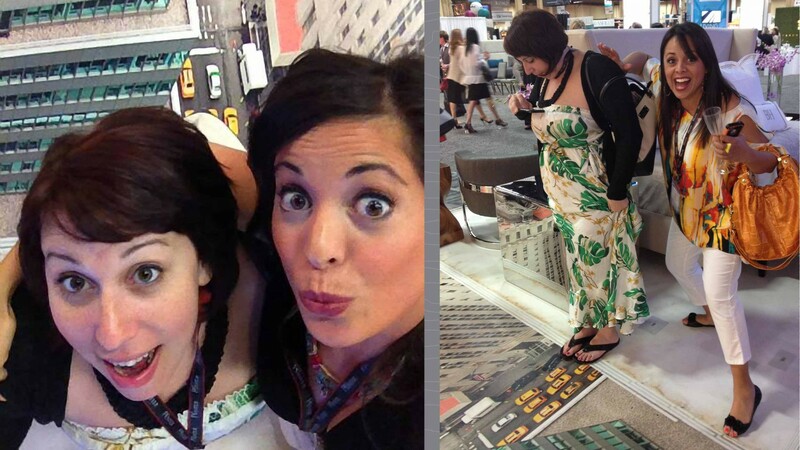 More interaction images from attendees of the HD Expo in Las Vegas. 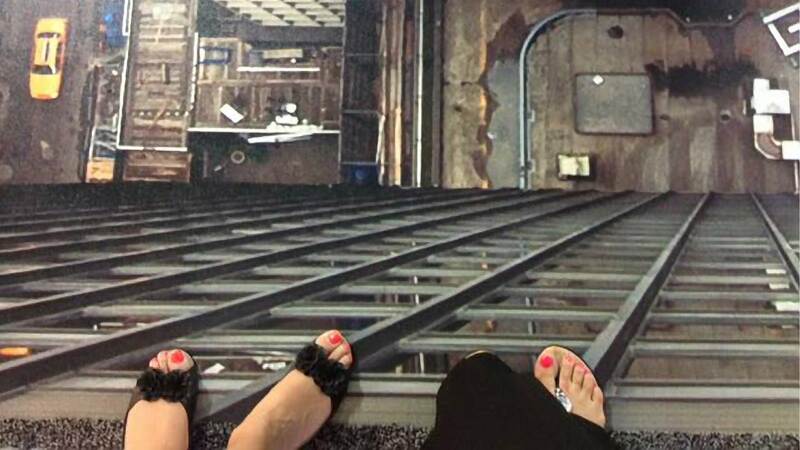 Images of HD Expo attendees’ toes overhanging the Bernhardt Hospitality Transcending to New Heights exhibit floor in Las Vegas. 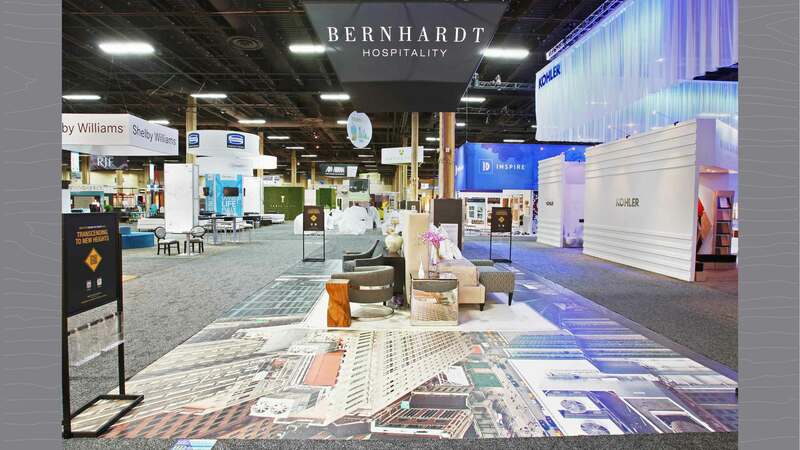 Photography of exhibit floor in Las Vegas, and images of attendees interacting with the exhibit floor, were kindly provided by Bernhardt Hospitality. All work samples displayed in this online portfolio reflect work that Kevin Brindley performed exclusively, unless otherwise noted above. © Copyright 2019 Work By Kevin LLC. All Rights Reserved.